Robin Hobb is not a concise writer. Her books are long, and often feel long during the reading for me, but unlike many other very long books, when I complete hers, I don’t feel that the text was wasted. For instance, when I finished Robert Jordan’s book The Dragon Reborn, I was let down. I enjoyed the book (didn’t love it), but realized after reading 500+ pages, that only one thing happened in that book that truly mattered. For how long it was, I would have expected more events to matter in the overall course of the story. But alas they didn’t, and that is why after book 4 of The Wheel of Time series I stopped reading (plus the fact that there was no end in sight for that series at the time). 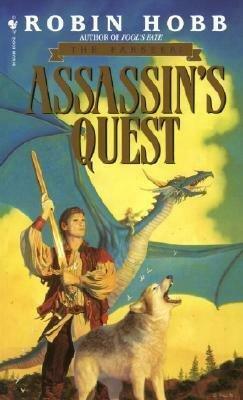 Assassin’s Quest is the final volume in the Farseer Trilogy, and I enjoyed it quite a bit. It is long, but the the depth of character you get is well worth the trip. Fitz is a character you watched grow up from a nameless boy to a royal assassin. And although at times he is not that likeable, you will want to read about him. Could these books have been shorter? Yes, the final one could have easily been trimmed, but I don’t feel at the same time that my time was wasted. Hobb does not gloss over any detail. The journey’s made in these books are full and complete. All details of the plot are well explored, characters well-defined. The only issue I have with this book is that there are some aspects of the story that are left-out that would have been interesting to further explore. The biggest being the story of Lady Patience who was left at Buckkeep. Unfortunately, this is really just a casualty of the the first person narrative. Hobb works her way around this at times with Skill dreams and Skill invasions, but since there was no link between him and Lady Patience, we rarely got her story and the defense of Buckkeep. That is a story I would have liked to have heard. As I have said in other posts this year, Hobb is a favorite writer of mine now, and next up is the Tawny Man trilogy (when I decide to read Hobb again).. I would rather read the Rain Wilds series next, but there are connections between all these books that I have heard are more obvious in these last two series, so I will read them in order. This entry was posted in Reading and tagged fantasy, reading, robin hobb. Bookmark the permalink.